That is such a cool idea! I’m going to give this a try. They’re perfect for me because I travel so much. These are so fun! Such a perfect upcycling idea and anything that makes life a little easier is always a great thing. That is a great DIY for getting your gardening urges taken care of. I think it is great to have the watering taken care of and just add the love and watch them grow. What a great idea! I am sharing this with my husband so we can make this with our plants! What a great idea. 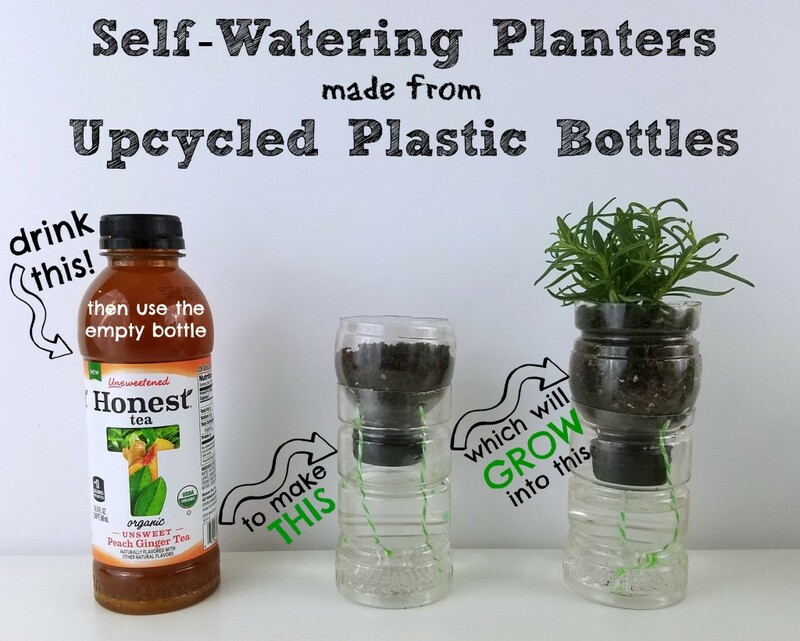 Even better since Honest Tea is my favorite kind of tea, but I do love the idea of reusing the bottles also. That is such a great idea. I love it. I need to try this out the next time we have some extra bottles. I love this idea. We live in an apartment so we have limited space and even if I wanted to plant outside, our “yard” has no grass. It’s all concrete. This is perfect! I have got to try this. It would be great to have fresh herbs on hand. I am planning on planting some herbs for the summer. These are a great way to recycle and have a great planter. Definitely worth a try. I never remember to water my plants. I will have to try this on the weekend. I would love to have fresh herbs to use for cooking. I love this idea! My husband is on the road a lot and goes through a lot of tea bottles, I really like finding ways to recycle them in a useful way. What a great idea! My kids would love to make one of these and just in time for Earth Day! That is such a great idea! This is something that I would like to attempt for my own plants. I might actually be able to keep them alive! This is absolutely amazing!! Such a great idea to recycle!! Would love to try this!! Nice DIY, it is really a great idea for making a self-watering planter.